In the March edition of Landwrap we have news about a Landonline outage at the end of the month; clarification about Easements for 'Telecommunications and Computer Media’; information about projection scale factors; and an issue with Post Registration Searches. Landonline will not be available on Saturday 30 March 2019, to allow our services supplier sufficient time to complete annual Disaster Recovery testing. A reminder will be sent out in the week prior to the outage, and Landonline will be available again at the normal start time of 6am on Monday 1 April 2019. There has been some confusion about Easements for ‘Telecommunications and Computer Media’ and how these are now described under the Land Transfer Act 2017. Please read our Easements for telecommunications and computer media KnowledgeBase article for clarification and our practice on requisitioning for terms and conditions. Surveyors regularly apply a projection scale factor when completing a survey on an official geodetic projection. Read about the different types of scale factors used in preparing a CSD and situations when a scale adjustment may be justified. To read more, please see our Scale Factors, Scale Differences and Scale Adjustment KnowledgeBase article. Some customers are receiving Post Registration Searches (PRS) which include Records of Title (RTs) that don’t relate to their client. This occurs if they are the submitting firm but an instrument in the dealing affects RTs other than their client’s. This might happen when registering an Easement Instrument or a Land Covenant. When the PRS screen displays as part of the submit process, all RTs in the dealing are listed. Beside each RT is a box that, by default, will be ticked. If you leave all boxes ticked, you will receive and will be charged for a post registration copy of each RT. However, the PRS screen is editable and you can untick any of the listed items you don’t need. 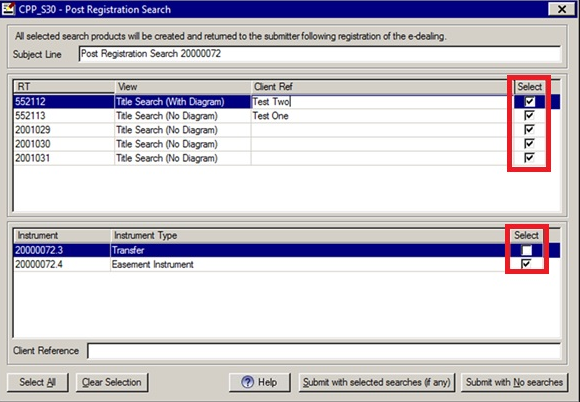 This means where there is an instrument affecting many titles and you only want a post registration copy of your client’s title, you can untick the other RTs so you are not charged for these unwanted items. Also, if new RTs are issuing from the dealing there is no title diagram associated to the title at the time of requesting the PRS. If you try to request the new RT as “Title Search (with diagram)” a message displays that no image exists. You can still request a PRS for the new RTs, but you must select “Title Search No Diagram” from the drop-down list in the View field.